Hello everyone, Monica M here and I hope everyone has enjoyed the holidays. I can’t believe Christmas is over already and the new year is almost here. With the new year fast approaching that means this is my last post with the A2Z team and Valentines Day will be here before we know it! So I better get some cards done and not wait until the last minute. I used a heart image from an older set to stamp in three different colors across the front of my card panel, before die cutting the sentiment out. I then die cut the sentiment three times from red cardstock and die cut the three hearts. To make the sentiment match I ran the ink pad across some white cardstock and then die cut it ( seen below). I adhered my panel on a red cardbase. 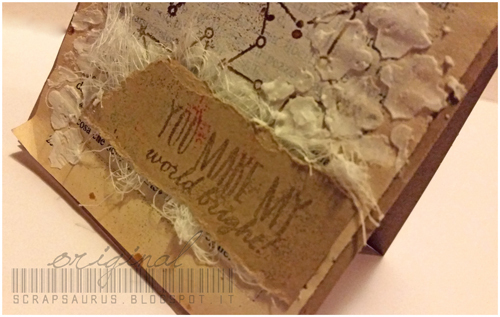 I glued the the three red and one gray sentiment pieces together before adding them to the card. I then adhered the hearts with pop dots, so they would have some added dimension as well. Thanks for stopping by and don’t for get you have a few more days to link up for the challenge. Happy New Year! Categories: Challenges, Handmade Cards, Hero Arts, Valentine | Tags: Challenges, die cutting, Hero Arts, Monica, Valentine's day | Permalink. Zoey’s again here for a card that might be great for the coming up Valentine’s day! It is not really all hearty and red and all of that, lol, but still I think it would make a cute Valentine’s card for maybe your best friend! 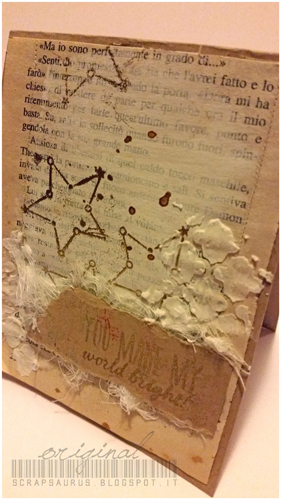 I also used some gesso and some old book pages. The technique I used for this card is our monthly challange theme! I love embossing, but I realize that I don’t do that really much, so it was nice to grab out the embossing powder and have some fun! 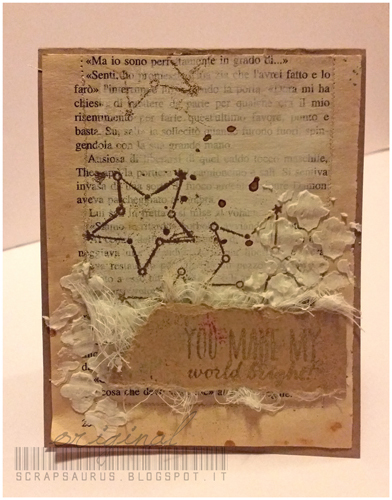 I stitched the pages on the side just to give a little of interest, I added gesso and then stamped the Stars from the Written in the Stars stamp set. I then poured over some Gold Embossing Powder and heat set it! I also added some texture through my all time favorite stencil… I love that stencil so much! Then all I did was glueing everything together! Here’s what the card looks like , I will give it to my best friend! Stay happy, stay creative…till next time! Categories: Embossing, Friendship Cards, Handmade Cards, Mixed Media | Tags: embossing powder, Hero Arts, Valentine's card, Valentine's day | Permalink.